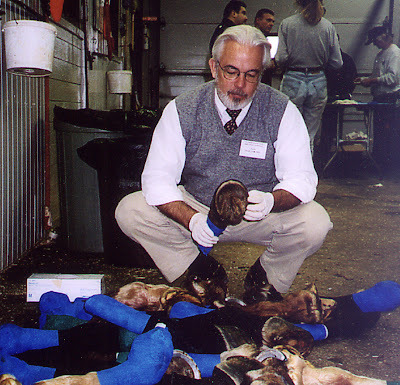 Dr. David Hood, director of The Hoof Project, at a recent seminar. News from Texas is that the new Hoof Project Clinic and research center in Bryan, near College Station, is humming with activity. The clinic is open for the treatment of laminitic horses, and David Hood DVM, PhD is actively directing a team of researchers involved in 14 different studies related to laminitis. Dr. Hood reports that 35 horses are in residence at the center, either in treatment or for use in studies, which include biomechanics, circulation, metabolism/nutrition, and laminitis pathology. Studies are particularly interested in the pain experienced by horses suffering from laminitis; Hood hopes to not just find ways to relieve the pain but also to determine the nature and source of the pain in order to prevent it. His previous studies documented that horses with lamintiis suffer from secondary sources of pain. Changes in stance, posture, and gait affect tendons and ligaments in the legs, and joint angles may be altered, leading to arthritis. Even back and neck pain can develop in horses that are standing in abnormal positions for long periods of time. The fact that a horse has chronic laminitis may predispose it other co-existing lamenesses, such as ringbone, collateral ligament injuries, sheared heels, or navicular damage caused by long-term hoof capsule deformation and abnormally high heels. Watch for announcements from The Hoof Project for the first series of seminars on hoof science to be held at the new facility.